Hello everyone, I’m back from my Christmas break and first of all would like to wish you a Happy New Year! I had a very peaceful and quiet break filled with netflix, hibernating, stuffing my face with cookies, chocolate and food, and more netflix. Basically, I didn’t do anything and it felt great. I’d like to kick off the new year with the one leisurely thing I did do during my break: an Amsterdam Light Festival Boat Tour. Unfortunately it was raining cats and dogs that day so I was unable to take quality photos myself this year. On the flip-side it gave me the rest to fully enjoy the cruise and look around. The Amsterdam Light Festival is an annual event that started in 2012. Artists, architects and designers from around the world are invited to submit their light art concept for the water or land exposition. A jury then handpicked 35 out of 900 submissions. Amsterdam’s streets, quays and canals transform into an outdoor light exposition with 35 bespoke designs for Amsterdam that are in line with the year’s theme. The theme of this year, 2017-2018, is ‘existential’. The illuminated canals and streets are a fun activity to enjoy with a group or your family during the dark winter evenings as the light art installations will be illuminated daily, from 5-11 p.m. Until January 21st you can either book a boat tour for the water exposition via the Blue Boat ‘Watercolors Cruise’ or visit the land exposition on foot at the Marine terrain. The land expo is free and only lasts until January 7th though, so this weekend is your last chance to see that. I embarked on the Watercolors Canal Cruise as I did previous years. The cruise lasts 90 minutes and takes you along 21 light art objects. New this year is an entertaining and informative guide on board the cruise who explains the stories behind the art and also throws in historical facts or an occasional joke. Also new is the special Kids Cruise with a live guide who adjusts the tour information to the young passengers and makes it comprehensive for kids. The Kids cruise departs daily at 4.45 p.m and is available till January 6 only. This art piece impressed me most. From the water it first seems like the Northern Light until you are right in front of it and see multiple jellyfish. Our tour guide recommended to also visit it on foot to experience it more intimately. The bridge between the Amstel and the Herengracht is temporarily a light tunnel that will transport you to another dimension. Because of the glass boat ceiling it truly feels like you’re travelling to another universe. 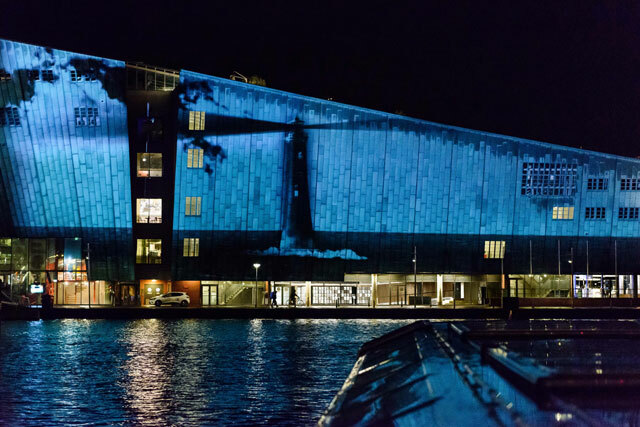 A Necessary Darkness by Rona Lee is an illustrious art piece on the NEMO Science Museumg. It’s not a projection of light but of darkness, shadows and silhouettes. A light tower that beams darkness. This is something you have to see yourself because it’s confusing and fascinating at the same time. Together with primary school students, Claudia Reh created a large and colorful projection on the facade of the Hermitage Museum. I also loved this Amsterdam city map of light floating above the Herengracht. The installation literally turns your world upside down for a moment. You would usually only be able to see this view looking down on a city, from an airplane; now it is right above your head and replaces the starry night while you boat is underneath. When: The Amsterdam Light Festival lasts until January 21st. The illuminations are lit daily from 5-11 p.m.
Blue Boat departure times: Daily at 5 pm, 5:15pm, 5:30 pm, 6:00 pm, 7 pm, 7:15 pm, 7:30 pm, 7:45 pm, 8:00 pm and 8:15 pm. Weekends 6:30 pm, 7:00 pm, 8:30 pm and 9:00 pm. Tickets for the Cruise: €21,50 for adults and €12,50 (Water Colors Kids Cruise) via the website or at the Blue Boat Company ticket office at Stadhouderskade 501.